Market Research | Market Force Information, Inc. Following our fashion research study, Dr. Cheryl Flink features on KOMO radio announcing the Nation's top 5 favorites. Peachtree Corners, Ga., Jan. 23, 2019 — The casual dining sector appears to be rebounding, with higher customer satisfaction levels in nearly every category, and innovative chains putting serious heat on larger brands, according to a new restaurant industry study by Market Force Information® (Market Force). The annual study of more than 6,700 consumers also reveals America’s favorite casual dining restaurants in seven categories, including general menu, pizza, breakfast, steakhouse, Italian and seafood. Across all categories studied, Maggiano’s received the highest score on Market Force’s Composite Loyalty Index (CLI) with 64%. Texas Roadhouse was a close second with 63%, First Watch and Cracker Barrel tied for third with 58%, and Cheddar’s Scratch Kitchen was fourth with 57%. Last year’s winner, Bonefish Grill, fell four spots to tie for fifth alongside Longhorn Steakhouse and Blaze Pizza. General menu restaurants are bringing more repeat guests through the door, an aspiration for most casual dining chains looking to boost sales. Eighty-six percent of those polled had dined at a general menu restaurant in the past 90 days, up from 79% who did so in 2017, the largest increase of any category. For the most part, every chain in this category is succeeding at delighting guests. Satisfaction scores for nearly all of the general menu chains studied went up significantly over the previous year. Cracker Barrel gained a sizable 12 percentage points to overtake Cheddar’s Scratch Kitchen for the No. 1 spot, and it ranked first for friendly service and atmosphere. Cheddar’s Scratch Kitchen ranked second on the CLI and led in food quality, fast service and value. BJ’s Brewhouse, which saw an 11 percentage point lift, ranked third. Hooter’s also stood out for increasing its score by 12 percentage points over 2017, and ranking highest for delivering an experience, rather than just a transaction. Could Breakfast Be Casual Dining’s New Darling? Breakfast and daytime-only restaurant chains are enjoying growing popularity, and First Watch is a prime example. The chain, which boasts fresh, custom-made foods appeared in Market Force’s study for the first time, and captured the top spot in the breakfast category with a CLI score of 58%. It dominated in areas such as quality and healthy food, although it ranked last for value. Bob Evans landed in second place with 51%, and Waffle House was third with 49%. Meanwhile, Village Inn, the 2017 category leader, dropped eight percentage points on the CLI to rank sixth and barely edge out last-ranked Denny’s. Pizza is another category that saw a shake-up in the 2018 study, with Blaze Pizza and Mellow Mushroom both joining the rankings for the first time and taking the No. 1 and No. 2 spots, respectively. The newcomers bested third-place Pizza Hut and fourth-place California Pizza Kitchen. Blaze Pizza, which has a made-to-order approach and saw its sales skyrocket to $279 million in 2017, dominated in important areas such as fast service, value and healthy options. For the fourth consecutive year, Texas Roadhouse has been named America’s favorite steakhouse chain, earning a 63% score, up from 57% in 2017. Longhorn Steakhouse received a 56% to again land in second place, while Outback Steakhouse ranked third with 50% and Logan’s Roadhouse ranked fourth with 47%. Texas Roadhouse had generous leads in value and service, while Outback was found to offer the healthiest choices. Overall CLI winner Maggiano’s also scored first in the Italian category for the fifth year running with a score of 64%, a four percentage point increase from the previous study. Carrabba’s ranked second with 54% and Olive Garden was third with 50%. Maggiano’s was found to have the best food and best value, which can be a difficult but critical balance to achieve in casual dining segment. Growth in the buffet sector has been stagnant, with just 24% of respondents dining at a buffet chain in the past 90 days – the same as in 2017. Golden Corral was the clear leader among the three chains studied, followed by Cici’s Pizza and Pizza Hut. Additionally, Golden Corral led by a large margin in categories such as variety and healthy options, although Cici’s was found to be the value leader. Seafood restaurants also failed to increase visitors over the previous year and, in fact, has the fewest visits of any category in this study. Bonefish Grill managed to garner a first place finish with a CLI score of 56%, despite dropping 12 percentage points from the previous study. It barely edged out Pappadeaux, which earned 55%, and Red Lobster came in third with 48%. Bonefish Grill scored exceptionally high for its atmosphere and cleanliness, as well as for food, an area where Red Lobster trailed considerably. The number of restaurant apps continues to grow, as does adoption among all age groups. In 2018, 54% said they downloaded a restaurant app, a 13% increase from 2016 when just 41% had done so. Restaurant-branded apps are the most downloaded, followed by Groupon, Yelp and Grubhub. Two-thirds of consumers polled are using them to view the menu, 59% to find discounts and just 54% to place orders. [See Graph 8]. Of the top apps, Yelp is most likely to impact restaurant choice, although Grubhub and UberEATS is where consumers go most frequently to post positive or negative comments about their dining experience. The study also found that between seven to 12% of consumers are consulting social media reviews before dining at a specific restaurant – those dining at breakfast and Italian chains are checking them less often, while general menu diners are checking them most often. Yelp and Facebook are far and away the most popular social channels for reading reviews prior to dining. Tabletop tablet adoption in casual dining restaurants remains lackluster, despite guests’ willingness to use them. Fifty-four percent (a drop from 58% in 2017) said they were given a restaurant-owned tablet while dining in 2018, and 90% of those used it. However, just one-fifth said using tablets made the dining experience more enjoyable. The majority are using tablets to pay the bill, look at the menu or play games, and few are using them to place an order. For the favorite rankings, Market Force asked participants to rate their satisfaction with their last experience at a casual dining chain, and their likelihood to recommend it to others. That data was averaged to rate each brand on an aggregation of the two measures – a Composite Loyalty Index. Only brands that received 100 or more reviews were included in the rankings. The survey was conducted online in November 2018 across the United States. The pool of 6,724 respondents represented a cross-section of the four Census regions and reflected a broad spectrum of income levels, with 56% reporting household incomes of more than $50,000 a year. Respondents’ ages ranged from 18 to over 65. Approximately 74% were female, 25% were male and 1% preferred not to answer. Market Force Information® is a customer experience (CX) management company that provides location-level measurement solutions that help businesses protect their brand reputation, delight customers and make more money. Solutions include customer experience surveys, employee engagement surveys, mystery shopping, contact center services and social media review tracking, which are integrated into one technology and analytics platform, KnowledgeForce®. Founded in 2005, Market Force has a growing global presence, with offices in the United States, Canada, United Kingdom, France and Spain. It serves more than 200 clients that operate multi-location businesses, including restaurants, major retailers, grocery and drug stores, petro/convenience stores, banking & financial institutions and entertainment brands. The company has been recognized as one of the top 50 market research organizations in the AMA Gold Report. For more information about Market Force, please visit us online at www.marketforce.com. The results of Market Force Information’s annual US banking study are in, and it’s good news for the retail banks. Consumer sentiment appears to be improving, as evidenced by the fact that 57% of those surveyed are very satisfied with their relationship with their primary bank – that’s up 8 percentage points over last year. Banking customers are also more inclined to recommend their primary bank to friends or colleagues. This year, we saw an increase on every one of those key measures. For some, scores went up nearly 10%. [See Graph 1]. As we embark on a new year, banks have the opportunity to renew their focus on the measures that matter most to their customers and drive satisfaction. Our hope is that we continue to see positive momentum in these areas and can report in 2019 that satisfaction and sentiment have continued to improve as a result of a keen focus on delighting customers and delivering an exceptional experience. 8 January 2019 — New Market Force research reveals what really drives people's satisfaction with their primary banking provider, and weak spots that smart institutions can exploit. Financial institutions need to understand consumers' priorities, particularly how important it is to handle problems when they arise. In 2018 Market Force conducted a study in which nearly 13,000 people participated. The study uncovered movie-watching trends, ranked the top theatre chains and revealed which customer experience attributes drive audiences to continue to keep coming back for the movie going experience. Find out which movie theatre chaings were consumers' favorites. 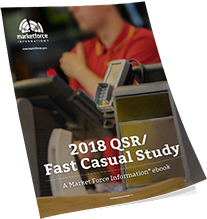 Market Force's 2018 research is compiled in a single document, and includes observations about trends in QSR and Fast Casual restaurants, as well as a delving into the survey results into seven categories, including Burger, Chicken, Mexican, Pizza, Frozen Desserts, Sandwiches and Coffee/Bakery. In the survey we evaluated each brand against six specific attributes, including dining habits, delivery services, visit frequency, brand engagement, customer experience, and problem experience. Peachtree Corners, Ga., Sept. 20, 2018 — Despite the growing popularity of Netflix and other streaming services, consumers are still frequenting movie theaters, particularly ones that offer an elevated and memorable experience for moviegoers. In a new large-scale study, Market Force Information found that more than 52% of consumers go to a movie theater at least once a month, and that Alamo Drafthouse Cinema is their favorite theater chain. Nearly 13,000 people participated in the study, which uncovered movie-watching trends, ranked the top theater chains and revealed which customer experience attributes help certain theater chains stand out from the rest. Austin, Texas-based Alamo Drafthouse, a smaller theater chain that’s grown a dedicated following for its in-seat bar and food service and its strict rules around theater etiquette, ranked as consumers’ favorite theater chain. It earned a score of 72% on the Composite Loyalty Index, followed by Harkins Theatres in second with 68% and Marcus Theatres in third with 64%. Landmark Theatres, an arthouse movie chain that Amazon was rumored to be eyeing, scored fourth with a 60% score. When the rankings were broken out by generation, Market Force Information found Alamo Drafthouse ranked highest among millennials, Regal Entertainment among Gen X and Your Neighborhood Theatres among baby boomers. Market Force Information also examined how the top theater brands fare in customer experience categories that matter most to moviegoers. Alamo Drafthouse is a clear leader for its box office and ticket collector service, and it also led in delivering a good value for money spent. However, it trailed in the convenient location category, likely given that it has fewer than 50 theaters in the United States. Marcus Theatres took the top spot for its seating options, Landmark Theatres for its movie offerings and Studio Movie Grill for its show time selection. On the flip side, Cineplex Entertainment ranked at the bottom in more than half the categories. Market Force Information looked at the customer experience in movie theater concessions as well, finding that 76% of moviegoers purchased food or beverages during their last theater experience. Alamo Drafthouse had the most concessions visits, followed by Harkins Theatres and Marcus Theatres. Alamo Drafthouse also clearly led in all of the food and beverage-related rankings, such as variety, taste and value. In the important value category, Studio Movie Grill ranked second, and Your Neighborhood Theatres and Harkins Theatres tied for third. Although more than half of consumers studied report watching at least one movie per month in the theater, and recent comScore data shows North American ticket sales were up 14% this summer, consumers are still largely viewing movies in other settings. The study found that 76% viewed a movie somewhere other than a theater at least once a month. Home continues to be the favorite place for movie-viewing. Of those who said they watch movies elsewhere besides the theater, 96% watch them on their TV at home and nearly half (48%) watch them on their mobile phones. Additionally, in the past 90 days, 79% reported streaming a movie and 57% watched one from a disc or tape – 82% on DVD, 61% on Blu-Ray and 9% on VHS. When asked why they chose to watch a movie at a particular theater versus another, 61% pointed to convenience. However, it wasn’t the only influence. The type of seating available was also important, ranking second on the list with 32%. One in five also appreciated the ability to reserve seats and purchase tickets in advance of the movie. Market Force Information also asked consumers what might lead them watch more movies in a theater. Nearly three out of four identified ticket price as the top motivator, but also called out other cost considerations such as concession prices and availability of coupons or discounts. More comfortable seating was the only non-cost related factor to rank in the top five. Loyalty is fairly lackluster in the movie theater industry, with just over half of consumers saying they are loyal to a particular brand. Marcus Theatres and Cineplex Entertainment have the most loyal consumers, with the majority of those surveyed saying they visited the brands almost exclusively in the past year. Additionally, Marcus Theatres has the most popular loyalty program, followed by Regal Entertainment Group. For the favorite theater rankings, Market Force Information asked participants to rate their satisfaction with their last experience at a movie theater, and their likelihood to recommend that theater to others. Only brands with 100 or more reviews were included in the rankings. The results were averaged to rank each brand based on a Composite Loyalty Index score. The survey was conducted online in August 2018 across North America. The pool of 12,896 respondents reflected a broad spectrum of income levels, with 54% reporting annual household incomes of more than $50,000. Respondents’ ages ranged from 18 to over 65. Approximately 72% were female and 27% were male. Peachtree Corners, Ga., Aug. 22, 2018 — IKEA is consumers’ favorite home furnishings retailer and Ace Hardware is their favorite home improvement chain, according to a new nationwide study by Market Force Information (Market Force), a worldwide leader in customer experience management. Market Force polled more than 1,800 consumers for the home furnishings portion of the study and more than 4,000 for the home improvement portion. In addition to ranking the home retailers, Market Force also looked at the attributes that set the industry leaders apart from the pack, including merchandise variety, store layout, value and customer service. IKEA, which has maintained steady growth in the face of mounting e-commerce competition, ranks as America’s favorite home furnishings retailer. It earned a score of 75% on the Composite Loyalty Index, placing it far ahead of second-place HomeGoods, which earned 63%. Target and Bed Bath & Beyond tied for third with 61%, and Walmart trailed with 43%. When it comes to the six most important customer experience attributes in the home furnishings sector, IKEA and Target take the top spots. IKEA ranked first for merchandise variety and availability, as well as value and store cleanliness. Target was found to have the best store layout and received the highest marks for ease of finding merchandise in its stores. Bed Bath & Beyond performed consistently well, earning a top-three ranking in all of the categories. On the flip side, Walmart ranked last for store cleanliness and merchandise variety, and tied for last alongside Target for value. Which Furnishers Excel in Service? Nearly half – 43% – of customers reported that they received assistance during their most recent trip to a home furnishings retailer. Nearly three-quarters found the associate friendly, but only 56% were asked if they wanted to purchase the merchandise in question. Not surprisingly, overall furnishings leader IKEA outperformed the other home retailers in customer service. Consumers find its associates to be the friendliest and have the most product knowledge. It’s also easier to find an associate at IKEA than other chains. Bed Bath & Beyond ranked second across the board, while HomeGoods ranked lowest for friendliness, overall service and ease of finding an associate. Ace Hardware, known for its neighborly service and an intense focus on the customer experience, earned the top spot among home improvement retailers once again in 2018 with a score of 68% on the Composite Loyalty Index. Menards ranked second with 57%, Lowe’s was third with 54% and Home Depot was fourth with 53%. Walmart was a distant fifth, earning just 36%. Market Force also looked at how the top brands fare in the seven attributes that matter most to consumers. Ace Hardware dominated, ranking No. 1 in all categories, with particularly strong marks for store cleanliness, checkout speed and store layout. Menards tied with Ace Hardware for first place for merchandise variety, and took second place for value, merchandise availability and store cleanliness. Walmart landed at the bottom in every category except value, an area that saw Home Depot rank last. [See Graph 5]. For the favorite retailer rankings, Market Force asked participants to rate their satisfaction with their last experience at a home improvement or furnishings store, and their likelihood to recommend it to others. Only brands with 100 or more reviews were included in the rankings. That data was averaged to rate each brand on an aggregation of the two measures – a Composite Loyalty Index. The survey was conducted online in June 2018 across the United States. There was a pool of 1,841 consumers for the home furnishings portion and a pool of 4,040 consumers for the home improvement portion of the study. The participants represented a cross-section of the four U.S. Census regions and reflected a broad spectrum of income levels, with 55% reporting annual household incomes of more than $50,000. Respondents’ ages ranged from 18 to over 65. Seventy four percent were female, 25% were male and 1% preferred not to answer. PEACHTREE CORNERS, Ga., July 31, 2018 — Non-contract wireless carriers are continuing to foster high levels of satisfaction and loyalty among consumers, much more so than their Big Four counterparts, according to a new large-scale consumer study by Market Force Information® (Market Force). The study found that Consumer Cellular ranks as America’s favorite carrier overall, and many other non-contract wireless providers also outperformed the major full-service carriers. The study of more than 8,800 consumers also reveals what sets the leading carriers apart, as well as trends in wireless usage, plans and contacts, in-store experiences and customer satisfaction. T-Mobile No. 1 out of Big Four Out of the full-service carriers studied, T-Mobile ranked first again this year on Market Force’s CLI with a score of 46%, a three percentage point gain over 2017. Verizon held steady in second place with a 38% score, a slight improvement over 2017, while AT&T ranked third and Sprint ranked fourth. Despite losing some footing over 2017, Consumer Cellular maintained a strong first-place ranking among non-contract carriers for the third consecutive year. Meanwhile, Cricket and Boost Mobile both gained a notable five percentage points – enough to advance Cricket from third to second place, and Boost Mobile from fifth to third place. When Stacked Against Others Market Force also looked at how all carriers — both non-contract and full-service providers —compare when it comes to attributes that matter most to consumers, and Consumer Cellular led in nearly every category, including value, call strength, plan flexibility, dropped call frequency and data speeds. Verizon narrowly beat out Consumer Cellular for network coverage, as did T-Mobile for access to new products. Straight Talk also performed well in many areas, such as having an easy-to-understand bill and call strength. Interestingly, the Big Four providers tended to trail in most categories, aside from those related to new technology and products. Market Force found wireless users are continuing to shift away from contract plans with term limits in favor of pre-paid and pay-as-you-go options. In the past two years, contract plans saw a 12% drop among consumers – from 62% in 2016 to 50% in 2018. In the same period, the use of pre-paid service grew by 7% and pay-as-you-go by 5%. Market Force also found that 14% of users are considering switching from their current provider in the next year, mainly for a better value, but also for improved network coverage and more flexible plans. Sprint customers are most likely to switch, and Consumer Cellular and U.S. Cellular users are least likely. As wireless technology becomes more advanced, in-store service takes on a greater importance among consumers who prefer to have their questions answered and phone features demonstrated in person. Cricket is the clear leader across the board, ranking first in nearly every in-store service category, from clearly explaining products and providing information, to taking time with customers and proficiently setting up features. T-Mobile led in friendliness, and ranked among the top three in several other categories. Overall, consumers are using the Android operating system (OS) more than Apple’s iOS on their primary wireless phones – 53% compared to 41%. The breakdown is also similar among consumers who consider themselves early adopters, with 51% reporting they use the Android OS vs. 47% using iOS. That’s a different story from 2017 when more self-described early adopters said they primarily use iOS. LOUISVILLE, Colo., June 26, 2018 —Wegmans is America’s favorite grocery retailer, according to an annual consumer study of more than 12,800 shoppers conducted by Market Force Information® (Market Force). Publix, which tied with Wegmans for the top spot last year, is a close second, followed by Trader Joe’s, ALDI and H-E-B. This is the third consecutive year that Wegmans has ranked first in the study, after unseating long-running favorite Trader Joe’s in 2016. Wegmans held on to the top spot with a score of 77% on Market Force’s Composite Loyalty Index. Publix, which has consistently ranked well in the annual study, is a close second with a score of 76%, followed by Trader Joe’s with 75%. ALDI moved up a slot from last year to land in fourth with a score of 70%, and H-E-B rounded out the top five with a repeat score of 69%. Whole Foods landed in the middle of the rankings with 60%, while Safeway and Walmart ranked at the bottom with 42% and 34%, respectively. Wegmans, founded in 1916, is known for its fresh produce, reasonable prices and massive stores. The New York-based chain is expanding steadily and, with a focus on employee training to ensure a great customer experience, it’s created a legion of superfans eager for a new location to open near their home. When it comes to the six customer experience attributes that matter most to consumers, Publix and Wegmans tied for two key ones – store cleanliness and item availability. Wegmans once again ranked first for its specialty department service, while Publix was the clear leader for ease of finding items. Trader Joe’s was found to have the fastest checkouts and it scored remarkably high for its courteous cashiers, besting second-place Publix in that category by nearly 10 percentage points. What leads shoppers to spend the majority of their grocery budget at a particular store? The study found that convenient location (62%) is the main driver, although good sales and promotions (60%), and value for money paid (55%) are nearly as important to shoppers. Food Lion customers more often say their grocer excels in convenience, while ShopRite customers say their grocer excels in good sales and promotions. ALDI is lauded by its customers for delivering good value for money, with Costco ranking second and WinCo Foods third. Consumer preference for local and organic choices at the grocery store is holding steady, with 58% of shoppers indicating that locally sourced meat, produce and dairy products are important. Forty-nine percent said they prefer organic when given a choice (down one percentage point from 2017), and 93% had purchased organic produce in the past 30 days, making it the most popular organic item, followed by meat, dairy and packaged dry goods. Baby products and paper products were the least bought organic items. Meal kit delivery services – where all the needed ingredients and a recipe are shipped direct to the home – continue to grow in popularity. Fifteen percent of study participants have tried a meal kit delivery service at least once (up from 11% in 2017), however, nearly half (49%) were less than satisfied with the experience. When asked why they opted for a meal delivery service, 50% said they were looking to add variety to their meal planning. Other popular reasons were to have a fun experience, save time and sample new ingredients. Hello Fresh overtook Blue Apron as the most popular meal kit service, with 39% indicating they’ve tried it. Blue Apron fell one place to second with 35%, and Home Chef was a distant third with 9%. However, 83% who tried a meal delivery service have stopped using it (up from 76% in 2017), primarily because of poor value, but also due to portion size and cost. Home Chef once again has the highest satisfaction rating and the lowest customer churn, along with Plated. Use of technology-assisted grocery shopping continues to increase, with more shoppers choosing online ordering and delivery, as well as click-and-collect (buy online and pick up at store). Fifteen percent of shoppers said they’ve used click-and-collect, compared to 9% in 2017 and 4% in 2016. Thirty-four percent are frequent users, taking advantage of click-and-collect at least monthly. Walmart, Kroger, H-E-B and Harris Teeter were the grocers most used in the past 90 days for click-and-collect shopping. Home delivery services for groceries are also growing in popularity – 22% said they’ve used the service, compared to 18% in 2017. Most (35%) are using the service to order from online grocery retailers such as Peapod and Shipped, 34% through general online retailers such as Amazon and Jet, and 24% order from a grocery store chain. However, one-fifth are still less than satisfied with the experience, leaving ample room for improvement. Although more shoppers are turning to mobile apps for grocery deals, it’s not dampening the popularity of circulars. Forty-four percent reported that they use a grocery app – up from 39% in 2017 – and they’re overwhelmingly using them to obtain coupons. That said, printed circulars have lost little ground in recent years, with 84% of shoppers continuing to use them at least weekly, and 14% using them at least three times a week. Eighty percent of shoppers said they plan their shopping trips based on the deals offered in the circulars, while 60% clip coupons and 59% use them to compare prices between stores. For the rankings, Market Force asked participants to rate their satisfaction with their most recent grocery shopping experience and their likelihood to refer that grocer to others. The results were averaged to rank each brand based on a Composite Loyalty Index score. The survey was conducted online in April 2018. The pool of 12,892 respondents represented a cross-section of the four U.S. census regions, and reflected a broad spectrum of income levels, with 52% reporting household incomes of more than $50,000 a year. Respondents’ ages ranged from 18 to over 65. Approximately 77% were women and 22% were men.